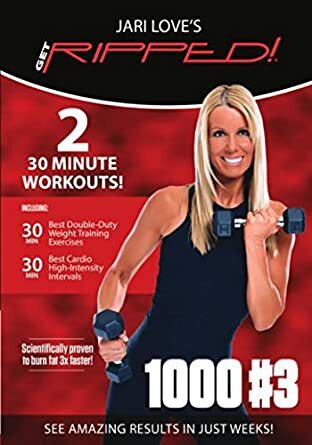 This DVD is one of the latest offerings from Canadian fitness instructor Jari Love, who first entered the video fitness scene about twelve years ago with her original Get Ripped! DVD. Since that time, Love has released a number of offerings in the Ripped series, including two prior "1000" incarnations. In her brief introduction, Love explains that the cardio includes plyometrics and that the strength work includes compound exercises. She also reviews the format: 4 rounds of each exercise (12-24 reps per set, depending) with a brief (about 15 seconds) active rest between sets. The equipment used for the workout includes various sets of dumbbells and a step bench, although it's possible to do the exercises without the latter. For the strength exercises, the weights that the participants are using appear on screen, but these can be difficult to read. With the exception of the Bonus Abs segment, the cardio exercises are the odd numbers and the weights exercises are the even (abs are #13). I have listed each exercise in order of the Complete Workout below, with my additional comments appearing on the second line. The warm-up and final stretch are not separately chaptered. These segments and main workout itself feature Love in her own living room with two female background exercisers, a stone fireplace behind, and upbeat music. As she does in all of her routines, Love uses light weights for the 5-minute warm-up, moving through squats, rear lunges with a press curl, deadlifts, flys, bicep curls, and overhead press, finishing with brief stretches for the calves and hamstrings. The 4-minute final stretch is all standing: Love performs a quad stretch, a bent-over double hamstring stretch, a brief back stretch, a Figure 4 hip stretch, and then calf stretches and 1-leg hamstring stretch each side to finish. Overall, this is a very solid workout video. The cardio is mostly low-to-moderate impact and easily modifiable. The weights tracks are more designed for high-rep, low-weight rather than heavy lifting, as the compound exercises target multiple muscle groups, both large and small. (I'm a regular exercise and used 5-lb dumbbells for most of the routine.) This would likely be a challenging video for beginners but is probably appropriate for experienced beginner to advanced intermediate exercisers.